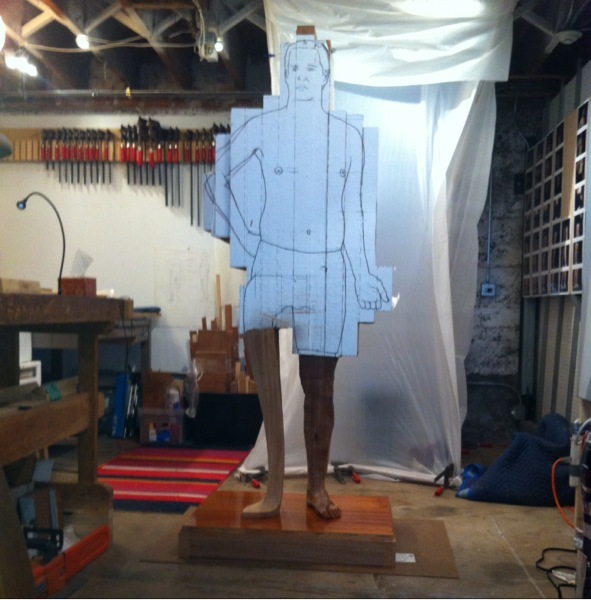 Today I stood the sculpture upright, now that the glue has dried in the pedestal joinery. It's kind of an exciting moment to be able to stand in front of this thing. I'll be adding the trim work to the pedestal next, which will leave only the finishing work. After that's done, I'll have nothing else to do but carve, carve, CARVE. I am currently an Affiliate Artist at the Headlands Center for the Arts in California. The Affiliate Artists Program is an immersive studio practice program awarded to approximately 20 Bay Area artists, writers, and designers annually. I will be in my studio through June 15, 2014. There are four public open houses over the course of the year - please check my events page for the upcoming Open House. If you are interested in a private tour, please contact me.